actuarial work and sales reporting. engineering problems, and commitment accounting. tabulations of demands and inventory groupings by dollar value. for items related to the weapon, rather than for specific commodity classes. accounting, consolidated requirements, etc. for AF engines. the system is used for inventory control. applicable subcommand. File maintenance is performed on a daily basis. reduces workload at sub-command level. from each unit and editing change cards for accuracy. management reports are also prepared from this system. estimates are provided for management purposes. detail records are created from this reporting system. lateral distribution of long supply items. in the master file with approximately 10,000 changes per quarter processed. preparation of initial and revised financial plans and budget estimates. preparation of special reports as desired by this or higher headquarters. 750 changes per month are summarized. Uses: Assists in raid recognition. maintenance of all records in the various segments of the system. USAF Hq MAAMA Olmsted Air Force Base, Penna. to establish standards and to measure the supply accomplishments. item data products may be periodically computed on an AF world-wide basis. item-dollar inventory segmentation, and requirements support effectiveness data. 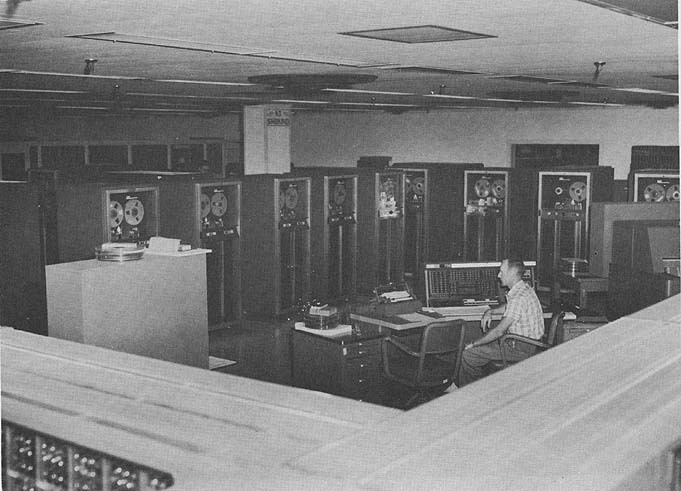 Located at Ft. George G. Meade, Maryland, the system is used for data processing. Amer. Tel. & Tel. Co., Long Lines Dept. accounting, and minor engineering studies. Convair - A Division of General Dynamics Corp.
control, cost ledger, tool control, and summary production status. Esso Standard, Div. of Humble 011 & Refining Co.
transferred to the 705, and we plan to release the 650 this year. blending of gasolines and other fuel products. accounting, scientific computing, multiple correlations and simultaneous equations. specification files, and engineering progress changes. preparation of purchase orders to suppliers. is used for the same applications as listed above. Located at the Main Office, 900 Bush Avenue, St.
requirements analyses, and production shop scheduling). multiple regression, and curve fitting. sale marketing, payroll, supply, and distribution. determination of maximum allowable operating pressures. absorption and stripping are also performed. inventory and accounting, and engineering and scientific problems. quality control reports, sales analyses, and miscellaneous reports. (payroll computation and compilation, deduction accumulations, and remittances. charges, and standard cost bulletin preparation. Automatic built-in subroutines include store for print and transmit. and provision for inclusion of a library of programs previously written. written in words close to english language. circuitry as well as provide an internal library of mathematical functions. Divide time = 17|11+Nd+(Nd - Nr)(7.5 Nr+15)| microsec. The drum is arranged in 300 bands of 200 char/band. The tape units are also used for input and output. Three different models of printers available. Cards and printer are normally used off line. 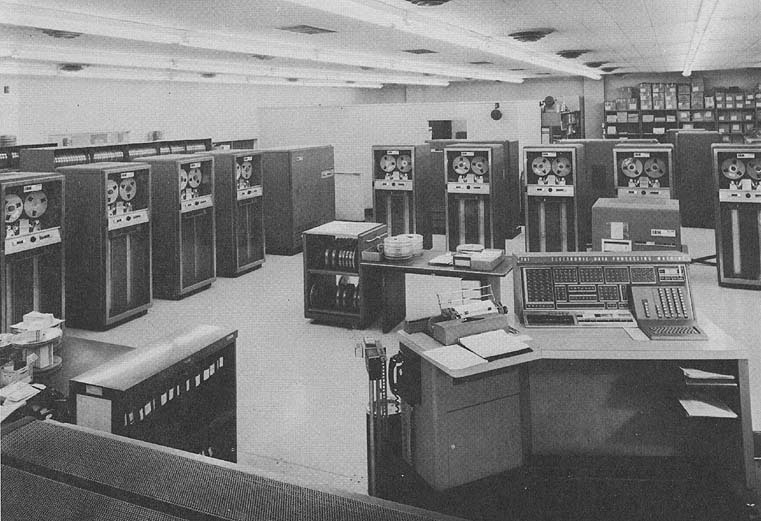 407 and 519 are used with IBM 774 (Tape Data Selector). Tape;	Cards; Printer 500 lines/min; Typewriter; Console. Printer used with TDS, max 150 lines/min; Typewriter 10 char/sec. and two 722 Card Punches off-line. input. All printing and punching performed off-line. either used as input or as output units. Cards. Card Readers; 1 Type 717 Printer 150 lines/min. where required. (But not two 720A printers at same time). storage, and typewriter. Also, there is an overflow check, and a sign check. to house the computer and related functions. for computer. New lighting and power system from existing building service. Room size, computer				55 ft x 65 ft approx. phase, 4 wire, 60 cycles/sec. Building was built for Computation Laboratory. 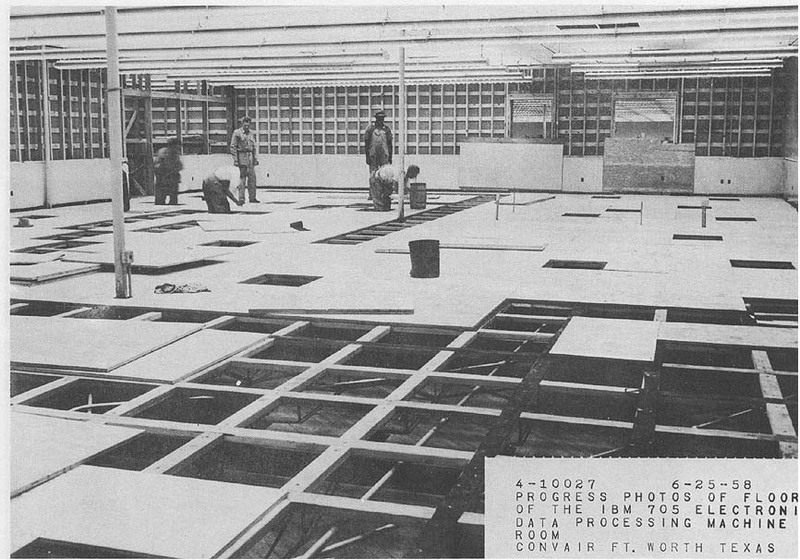 Concrete slab construction. ing of 60,000 sq ft.
sources of electric power with automatic switch over. conditioner is fed 430 volt, 400 amp continuous current. cooling tower, refrigerating units, sir handling units. conditioner is used for whole building. transformer bank is used to supply each system. floor from mezz flooring to eliminate vibration. directly to beams rising from main plant floor. conditioning control panel, and air conditioning machinery room. for lighting, etc. ; and install acoustical tile on existing ceiling. A portion of subject building is leased from the Service Bureau Corporation. Room size, air conditioner				18 ft x 31 ft x 6 in. 17 ft x 40 ft x 11,6"
construction with inside  wall of Johns Mansville construction. Power supplied by public utility company. relays and separate power transformer servicing EDP equipment only. except for special duct to main frame. Only 55,% required for present equipment. ceiling (Accustone) suspended from roof beams under original suspended ceiling. lighting power taken from existing 440 volt mains. the present time. Delivery on availability basis only. Tape Control, rents at $23,350/month. trol, 7601 Control, 758 Control, rents at $9,350/mo. 2 tp 519, 1 tp 557 - total monthly rental $6,120. Present monthly rental including overtime is approximately $55,000. $32,260 per month (each of two systems). and control units - $47,000/month, prime shift. tor, calculators, interpreters, summary punches, etc. in support of 705 - $13,000/month. $1,093,500 and rents at $28,370/month. $1,227,345 and rent at $26,000/month. $956,360 each (2 systems) and rents at $23,500/month each. age, 722 Card Punch, 758 Card Punch Control, 2 ea. reader, and ten 727 tape units rent at $32,000 monthly rental. 407 and 519 rent at $8,000/month. Maintenance and service are provided by vendor. CPU, on line printer, reader, punch and 10 tapes. Peripheral equipment: 2-720A, 1-714 and 1-722. Rent - primary shift $44,000/month. of 1176th of 40% of the monthly charge. (2) May be operated "on-line". Card Reader; rental is $28,560/month. 727 Tape Units rent for $18,010/month. and technicians are furnished by contractor. various departments and may work on any project. Engineers and technicians furnished by manufacturer under rental contract. One additional supervisor is required for each additional 8-hour shift. additional input-output operators are required for a third 8-hour shift. Operators are used on 704's, 705 and 709 in rotating shifts. The 12 IHM engineers rotate shifts on the 704's and 709.
operating hours are continuous from 7:30 A.M. each Monday through 7:30 A.M.
operations. The operators also perform all "off-line" operations. 4:00 P. M.). A tape librarian is also assigned to the basic shift. the basic logic for new operations. Programmers receive a basic course in programming from the IBM Corporation. equipment, on the job, from our more experienced operators. Above requirements is for each system. Machine operated three (3) shifts seven (7) days per week. SBAMA EDP personnel requirements support the logistical mission. integrated data processing system to provide extra off-line capability. Coders are included in the programmer category. 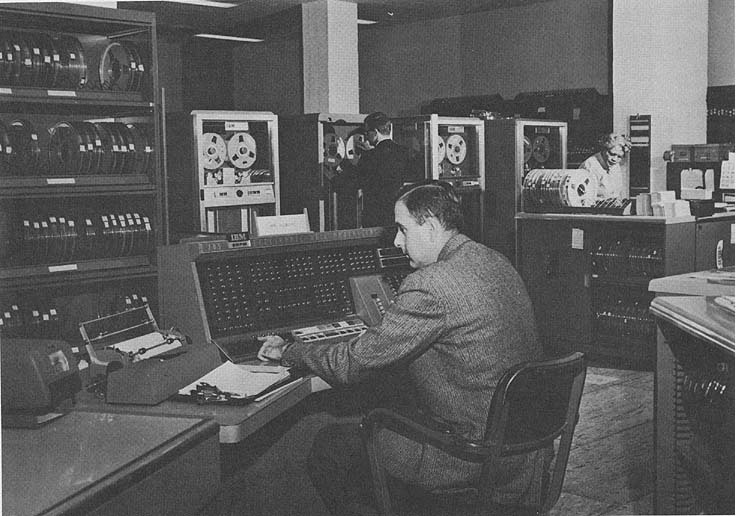 techniques in various computer configurations provide system flexibility. provided on a contractual basis by the manufacturer concerned. 8-hour daily shifts, 7 days weekly. One operator and 2 tape handlers are used on the 705 at all times. weeks and approximately 2 years on-the-job training. Operators and system analysts are supervisors. In-output operators and tape handlers are interchangeable. own people train our 705 people on our premises. Supervisors are for entire Data Processing and Programming Departments. handling is done by 705 operators. shift. Two additional inputoutput operators are recommended. Eleven additional operators are required for two additional 8-hour shifts. and staff. On-the-,job training used. Therefore, all personnel are trained as console opera. operator, tape handler, or technician classifications. programming work but only for the internal operation of the computer center. One additional input-output operator is recommended. An additional clerk and a librarian are recommended. are normally selected from departments of the company. are classified as management personnel. our more experienced programming personnel and supervisors. for rent under present workload conditions. Time is available for rent to qualified outside organizations. P. M. the computer is used to "debug" and test programs. breakdown time averaged 16-13 hours per month. time after maintenance down time. Sep 57; time is not available. 60; Feb 60; time is not available. Mar 60; May 59; time is not available. 58 Time is not available for rent to outside organizations. Sep 56, 2nd - 28 May 58; time is not available. Apr 60; 18 Aug 58; time is not available. users under a Mutual Assistance Contract. program failure, re-run time, operator error, and machine failure. Aug 57; time is available. exceptionally high. Normally the operating ratio would be about 0.98.
rental is available, dependent upon our schedules and size of job. 15; 87; 93; 0.935; Jan 60 to Jun 60; Apr 57; time is not available. 5; 61.8; 66.9; 0.93; 28 Mar 60 to 22 May 60; Sep 57; time is not available. reciprocal use of computer in case of machine breakdown. installation. This assistance begins twelve months in advance of delivery. Many systems have been installed. memory and input/output read while write and high speed rewind. Unique system advantages include compatibility with other IBM systems. provided with a capacity of over 3,000 tapes. line switch on card reader, as well as standard one on the control. cards on tape case. Labelon used for temporary special identification. Separate storage of grandfather tapes and transaction tapes for emergency recovery. All magnetic tapes are labeled with "labelon" pressure sensative tape. file recovery in case of total site destruction. Fahrenheit and 40-60% relative humidity. and equipment in case of fire or other emergency. Outstanding features are read-while-write and variable length records. 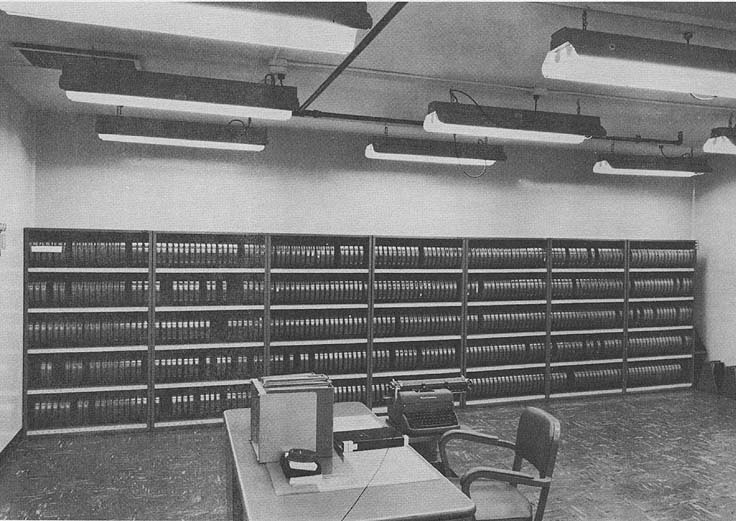 General Humidity: kept in computer room - fireproof building. same protection as the computer itself. economical centralized control on command-wide applications. by Run Number and Tape Number. system and 22 files in the second system. such as "no smoking" are enforced in proximity to magnetic tape files. part of A.L.S. is used. controls in the operational phase of EDP. A unique system advantage is the variable word length. New York on a quarterly basis. Shipping in metal fireproof boxes. temperature controlled area. Smoke detectors installed. No sprinkler system. Mylar tape is used which does not require close humidity control. permanent reel number and 1 - job number (data stored on tape). 60%, temperature at 70o to 75o. C02 fire protection in tape storage rooms. All tapes are identified by number on the reel. given tape identification in the ,job program. display. A unique system advantage is the variable word length type system. humidity and temperature. External tape labelling system used. header from one computer to the other. All tapes are magnetically labelled and checked at the start of each job. conveniently placed and all personnel trained in their usage. tapes are used in following job and it is complete. and checked out. length. Tapes are stored in a vault, primarily for security, also for fire. representation for each memory position, and read-while-write feature. master key switch to turn off all power, and a fire hose. in metal cabinets in an air-conditioned vault adjacent to the machine room. All areas are protected with a sprinkler system. are not removed from computer room. Data on tape not sent out or received. Temperature and relative humidity consistently maintained at 750 and 50% respectively. installed ar frequent intervals Around perimeter of room. IBM 1401C with 1402, 1403 and one 729 on order to replace 720 Printer. 705 some of smaller jobs. determination made as to replacement machine or date of replacement. rents for nearly $500 less per month. II, and will program the application for the appropriate equipment. completed by the first of next year. Units will replace the present equipment. replace the 720 Printer and Card Punch now in use. 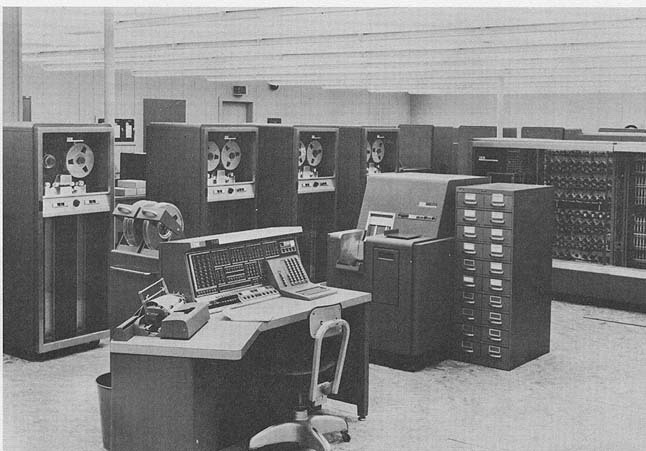 IBM 1401 Computer Systems are scheduled to be acquired at Norton AFB. items such as tape data selectors and printers. at Hq AMC, Wright-Patterson AF Base, Dayton, Ohio. Magnetic tape to magnetic tape transmission. 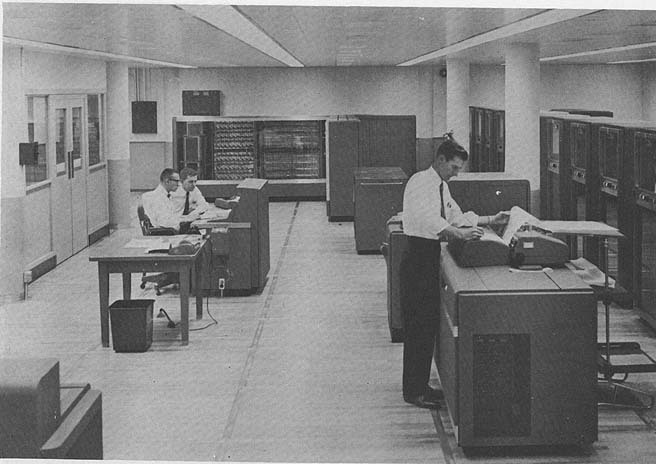 IBM 1401 to replace peripheral equipment. Replace present 705 II with 705 III with 729 III high speed tape drives. 80K memory, two DSU's and twenty tape drives. use with 705 III to replace Type 714 Card Reader. 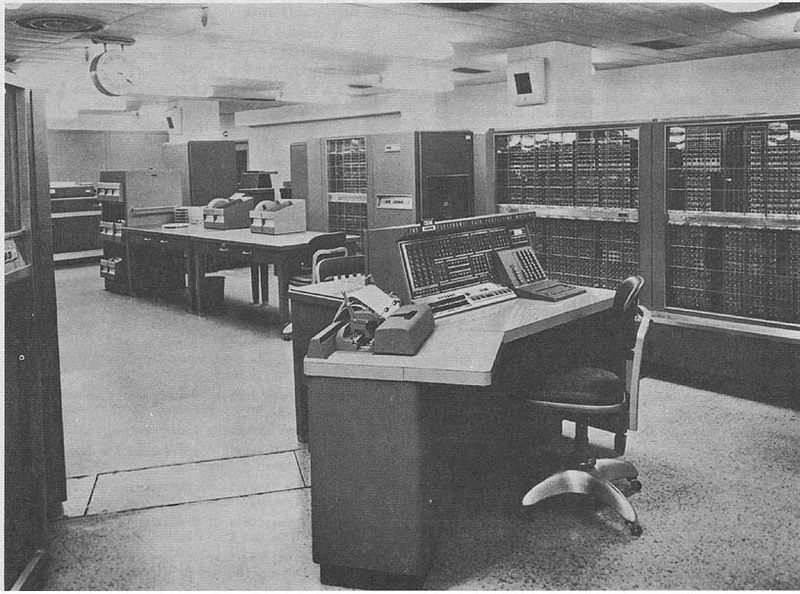 Install 1 IBM 7080 Computer to replace 1 IBM 705 Computer. We have on order two IBM 1401 Tape Systems. auxiliary equipment and replace it with 2 1401 Systems. master bills of material, and related computer applications. has not been chosen as yet). manufacturing production requirements. (Scheduled for mid-summer). Convert existing 705 Model I System to 705 Model II System. Installation, by lessor, of a 5,000 KVA transformer to stabilize line transients. 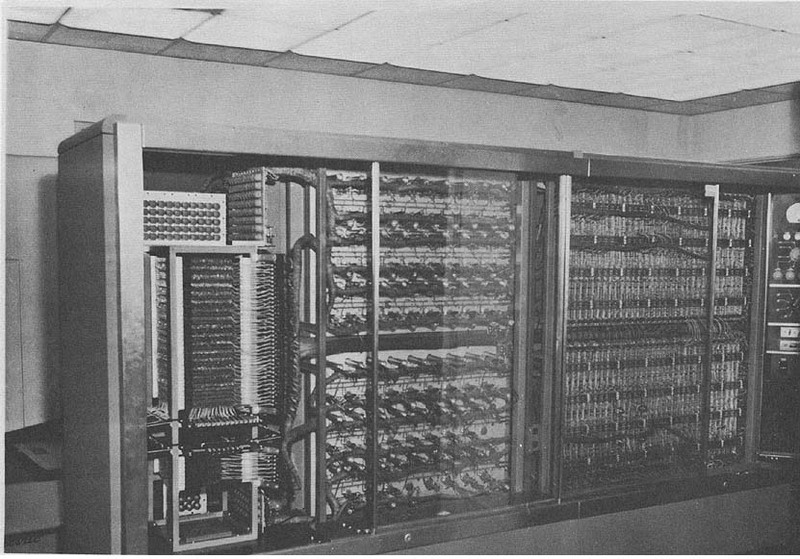 IBM Model 7080 to replace existing equipment. underway to fill up available time on the computer. Replace Model II 705 with a Model III 705.
equipment with three 1401 Systems. (various functions, and linear and nonlinear programming. Install IBM 7090 with 16 7P9 IV tapes on line. York, and 2 in Chicago. 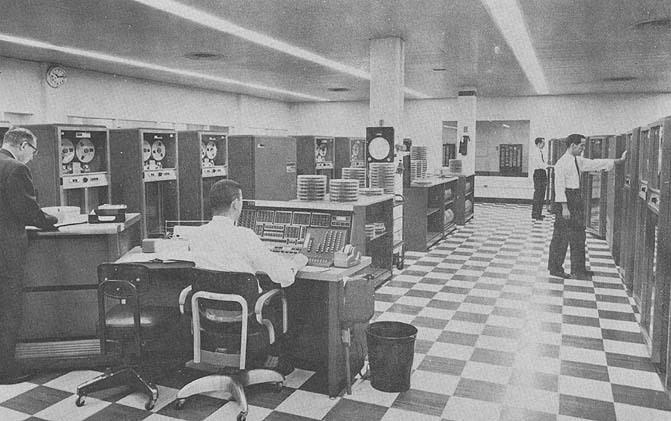 units will be replaced by two IBM 1401 C EDPM's and one IBM 1401 D EDPM. speed - high density type 729 tape units. wage incentive crediting, and customer contract preparation and billing. American Telephone & Telegraph Company, Long Lines Department, Mt. Tennessee Coal and Iron Division, United States Steel Corporation, P. 0.